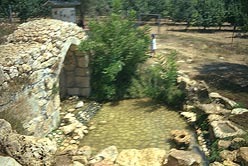 The old water source on Tzuba was this spring. It's typical of watering systems all over the Judaean hills. This is where the water comes from, deep inside the mayyan. 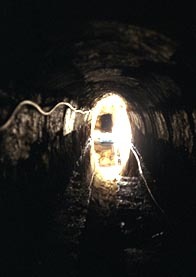 To get out, it goes through this tunnel. You can crawl through the tunnel too. This is how tourists get to the spring. What was once a raw spring was institutionalized thousands of years ago. Farmers built a pool at the mouth of the spring, which eventually came to include a pleasant shelter too. From the pool, water runs out down narrow channels to cisterns and to the terraced fields below the spring. You can see an orchard in the background above, but this water is no longer used on kibbutz. The old stone watering system has fallen apart after years of disuse. (The water still flows fine, though.) 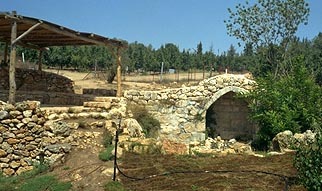 Lately kibbutzniks and volunteers have started to restore the system, as an archaeological attraction. Here you see the mouths of a partially excavated cistern system. Silt had been piling up in the cisterns forever, until they no longer held water. 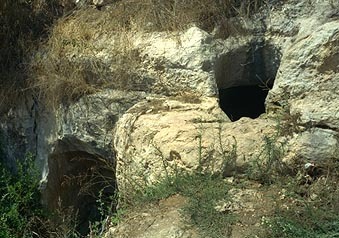 You can follow a crease in the rock that starts on the right edge of the picture, in the middle, and goes up at a slight angle and across the cistern mouth, then on across the picture. This is actually a (now dry) water channel, which brings the water from the mouth of the spring down to the cisterns. 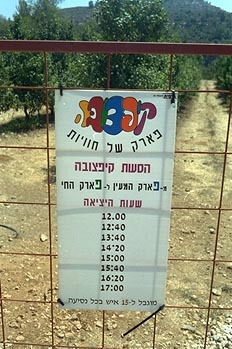 When the kibbutz was being built, the old mayyan was of more direct use to the kibbutzniks. There was no other water source on the kibbutz, so every morning, one of the kibbutzniks would come over the hill with a donkey to fill water jugs and bring them back over to where the kibbutz buildings were going up. 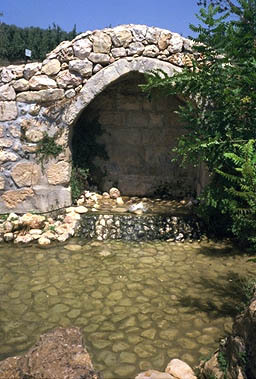 The pool at the mouth of the spring also was used for outdoor bathing purposes, since there were no showers on the kibbutz. Workers would bathe in two shifts--men and women. No peeking from way back in the trees! The night after the kibbutz jubilee celebration, after the members enjoyed a sumptuous Shabbat dinner al fresco, they got to watch a video presentation someone had made about life on the kibbutz. One of the original members explained how she had to go get water every morning, and how it hurt her heart to have to make that donkey haul the water, because he didn't want to, but she knew the kibbutz needed it, so she'd hit the donkey and shout "Come on, come on!" until finally he'd drag the load over the ridge. A recent addition to the mayyan is the shady shelter on the left, dedicated in memory of a relative of one of the kibbutniks. 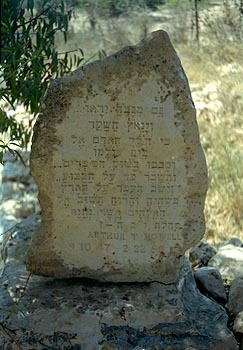 The dedication plaque cites Ecclesiastes. 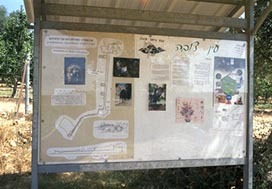 Other recent additions include this interpretive display. In the upper right is the source of the water. (The spring has twin sources, which come together in a V at the top of the diagram; the picture at the top of this page is of the source on the right.) The springs are both in a subterranean cave way back in the hill, which would antedate the pleasant pool out at the mouth of the spring. From the source, the water flows down the long straight tunnel pictured further up on this page and into the pool, near the bottom of the diagram. 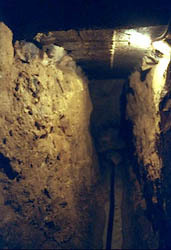 Then it runs through a channel carved in the side of the rock, down to the cistern pictured above, which is the rectangular shape at the bottom left end of the diagram. 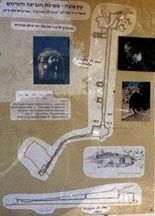 The other two diagrams in the display above are a sketch of the pool at the mouth of the spring and an illustration of the vertical drop from the source, on the right, to the cisterns at the bottom of the current water system. Note that the watering system here runs nearly flat; there's not much drop as manmade channels lead it about a hundred meters from where it bubbles up. For a watering system thousands of years old, it's nicely built. After the cisterns, in older times, the water of course would have flowed even further downhill, as it irrigated the terrace plots of the village farmers.